Are Essential Oils the Answer? Every beekeeper wants healthy honey bee colonies. Healthy bees produce more honey and are rewarding to manage. Is the use of essential oils to promote bee health a good idea? Beekeeping has seen a surge in popularity in the last 10 years. Many of these new beekeepers are concerned about the effect of pesticides in our environment. They have a passion for finding non-chemical ways to help bees. Instead of mindlessly “going with the flow” and using conventional method of varroa mite treatment, etc. We see a desire for more natural methods of keeping bees . Interest continues to grow in the use of natural compounds instead of synthetic chemicals. The use of essential oils for honey bees has become a popular component of bee management. Are Essential Oils Safe for Bees? Like most beekeepers, I struggle to maintain healthy honey bee colonies. I dislike seeing sick colonies and all beekeepers feel helpless sometimes. We are faced with the possibility that some of the treatments may be doing more harm than good. 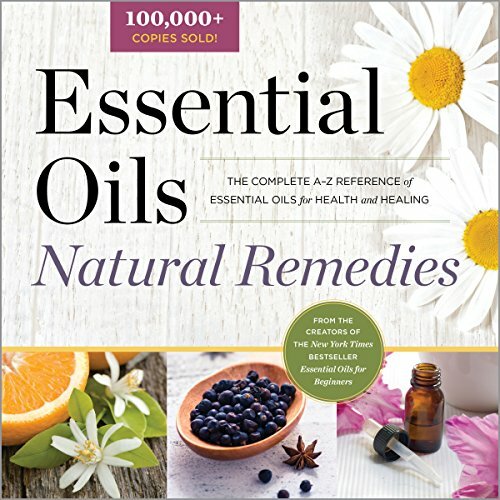 Essential oils are natural products but that does not mean they should be used – “willy nilly”. These are powerful compounds and can do great harm when used in the wrong way. Before using essential oils for bees or any other purpose, educate yourself on the safe handling and proper use of all oils.You can possibly harm yourself and your bees if you don’t understand the dangers. Never put essential oils in your beehives without doing your research. The major problem facing our honey bees is varroa mite infestation and the diseases they spread. Is using essential oils for varroa mites a sound- more natural option to hard chemicals? Maybe. Our bees are facing stress from diseases and pests ( including mites ) that have been introduced from other countries. Over time our honey bees might build some resistance to these problems but that doesn’t help them right now. Beekeepers are devastated emotionally and financially as they watch colony after colony perish from mite related issues. In desperation, some try non-approved methods that can end in disaster. Still, we struggle to find a way to give our colonies a boost against poor health. Unhealthy colonies are much more susceptible to viruses and other problems. It is not just mites that take a toll on our bees. Environmental changes and contamination contribute to poor bee health. Toxic substances in the water, plant nectar and pollen are brought back to the hive. In an effort to increase a more diverse diet for honey bees and other pollinators, many people are planting pollen and nectar rich plants! The bees receive different nutrients from a variety of sources. 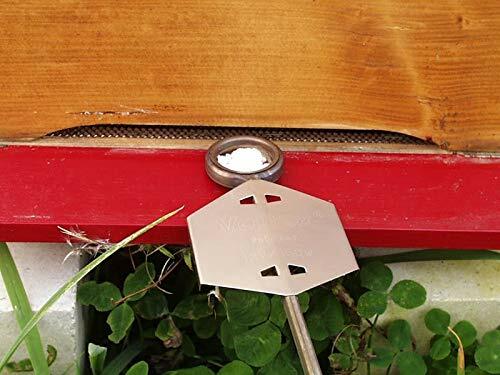 This is a great way to help bees even if you are not a beekeeper. Better honey bee health is the goal and diet is an important factor. Can healthy bees deal with mite infestations better? Yes, but the battle against varroa mites continues. Most colonies will not survive without beekeeper intervention. The use of essential oils as a food supplement for honey bees is common in the beekeeping world. However, most of the methods of application and many of the oils are not considered approved for use. Then why do beekeepers use them? Because our bees are sick and we want to save them. We love our bees and it is financially devastating to watch colonies die. Sick bees die more easily and live shorter less productive lives. They also do not produce as much honey. This situation makes it difficult to survive as a beekeeping business small or large. Most beekeepers care very much about the welfare of their hives but it is also an economic issue. Losing a thousand dollars worth of beehives in a season causes you to look around for other options. Colonies that die during winter must be replaced each Spring. A beekeeper can spend hundreds or thousands of dollars buying new honey bee colonies to replace the deadouts. Sick honey bees also affect the wild bee colonies. Pests and disease are spread to feral colonies. These colonies contribute to the pollination of various wild flowers. We want all our of pollinating insects to be healthy and productive. How to Use Essential Oils in Beekeeping? Most recipes that involve using essential oils for bees will include a sugar water component. It is a well known fact that water and oil doesn’t mix easily. Getting your oils to disperse well in sugar water is made easier by the use of Lecithin Powder. This powder eases the mixing of your products and does no harm to the bees. Only a small amount is needed so it lasts a long time. Do Your Essential Oil Research First! You should not choose a random oil and throw it in the hive. The beekeeper must find the proper essential oil mix for bees. Using the wrong product or the wrong strength can kill your bees. Use care don’t rush in. And don’t forget to protect your skin from some of these oils are they can cause health problems for you! Before you pop the top on that bottle of essential oil – grab your gloves. Some essential oils are absorbed through the skin and can make you sick or worse! Our skin is very different from the cuticle of a honey bee exoskeleton. 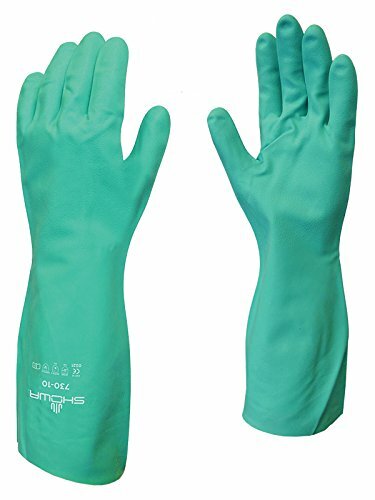 Play it safe and use chemical resistant gloves when working the any chemical compounds to be used in and around your hives – yes, even natural ones. Although many combinations of essential oils are used for honey bees, 3 are most popular. The most popular oils used in beekeeping are : Lemongrass Essential Oil, Spearmint Essential Oil and Thyme Essential Oil. Some sources recommend wintergreen, spearmint and tea tree oil as well. 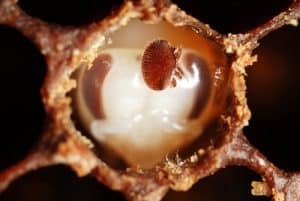 The biggest danger facing honey bees today is the pest known as the “Varroa Mite.” Varroa Mites can be seen on the exterior surface of adult bees. They feed on the blood (or hemolymph) of honey bees. Adult bees that suffer parasitism by varroa mites live shorter lives and are not as productive as healthy bees. The mites that we don’t see cause the most damage to a bee colony. 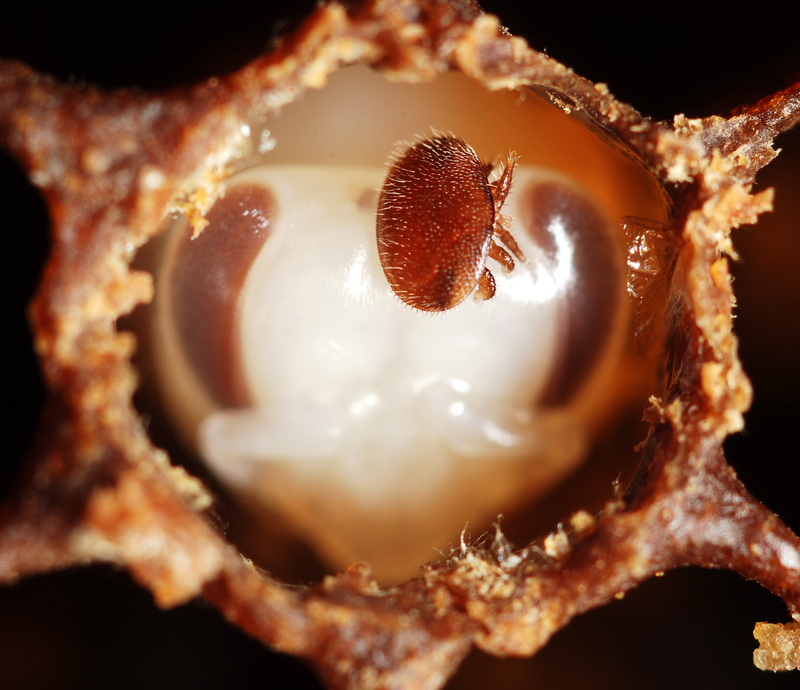 As part of their reproductive cycle, varroa mites enter the cells of bee larva and feed on the young bees. This causes sickening and deforming of the baby bees. In addition to weakening the pupa and leaving open wounds, mites aid in the spread of viruses. Why Essential Oils & Other Treatments Look Desirable? How do you kill a bug on a bug? Its not easy. But, it is easy to see the dilemma facing all beekeepers. This is especially challenging to new beekeepers who already have so much to learn. A continuous track of chemical treatments has been developed to fight mite infestation. However, some of the approved treatments contain toxic substances that accumulate in the wax and honey of the beehive. These chemicals can accumulate and build over time. Some beekeepers – hobbyist and commercial are using unapproved methods that may do no visible harm to our colonies. But they could still have unseen detrimental effects on our bees. 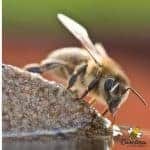 These issues bring the idea of using essential oils for honey bee mite control into consideration. We all seek a more natural approach. Most beekeepers do not want to put chemicals into bee hives. But that doesn’t mean you wont have any chemicals in the hive. Chemicals are already present in our environment and the bees will bring some of that toxicity inside. This is another reason we dislike the idea of adding anything more to the “chemical footprint” of the hive. This is why the idea of using essential oils for varroa mites is so appealing. They are readily available and natural products. Beekeepers are hungry for natural methods of dealing with varroa mites. Bee research companies have joined the search for more natural methods of dealing with varroa. Natural chemicals such as the essential oil Thymol has been used for mite control. Natural chemicals such as the essential oil Thymol has been used for mite control. 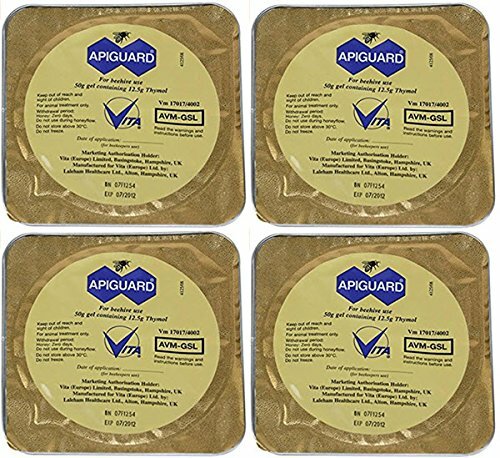 Apiguard is a thymol based treatment used by many. I like this one too. The challenge is that while these essential oils and natural treatments do kill mites, they do not do so as efficiently and quickly as the harder synthetic products. Our goal is to find a way to use the natural products and still receive good, consistent results in varroa mite control. Are Essential Oils the Answer to Mite Control? I have not found a single approved mite treatment that works well all the time on all the colonies. Most beekeepers use a treatment plan that consists of several different treatment types. As you move away from the “harder” synthetic chemicals, effectiveness drops. But some of us do not want to use those chemicals in our hives. This post highlights the struggle to find an effective natural varroa mite treatment. Can essential oils for honey bees be the answer ? Will the oils aid in the control of varroa mites and have no adverse effects in the hive? Perhaps, only time will tell. Oxalic Acid is one natural method that has become available to beekeeping in the US. I am currently using a heavy duty oxalic acid vaporizer. I chose this model because it has been used in Europe for years with good success. Yes, it costs a bit more but I have confidence in it and it has not let me down.This is only one component of my varroa mite management plan. If you don’t have the time to make your own essential oil recipes for bees, you do have a few options that are ready to use. 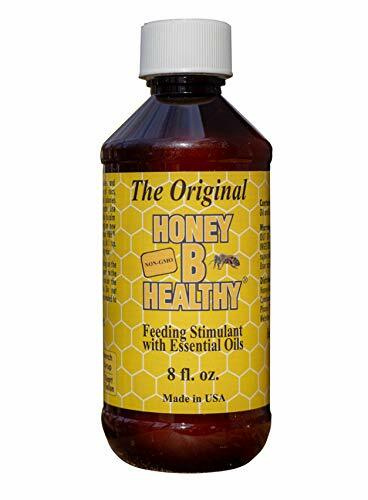 Honey B Healthy Original Feeding Stimulant with Essential Oils – 8 oz. “Honey B Healthy” is a popular supplement for improving honey bee colony health. It is a proprietary blend containing essential oils. A small amount of HBH added to sugar water serves as a nutritional boost. For many beekeepers this is a great solution. I have used it for years and cannot say enough good things about the product. You will always find a bottle of Honey B Healthy in my equipment shed. 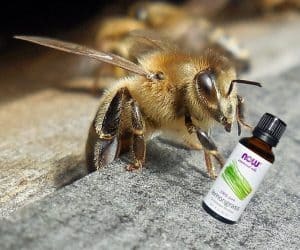 An unique way of using essential oils for honey bees, the product can be added to sugar water, mixed into pollen patties and added to sugar water for spraying directly on the bees. If you have many honey bee colonies, you can create a similar mixture for your colonies. 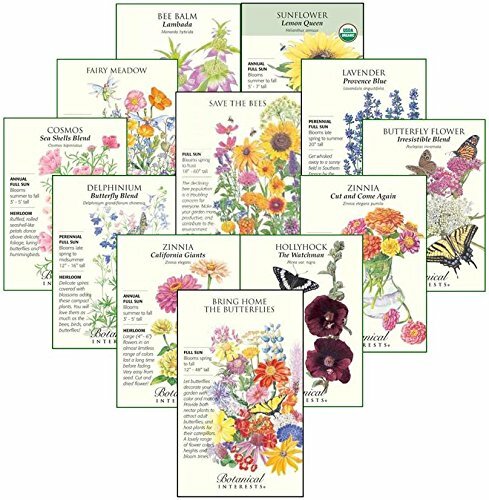 If you have only a few colonies, it might be better to purchase an essential oil mix for bees-ready to use. I have tried the homemade Honey b Healthy (copycat) recipe. I found it difficult to get a perfect blend of ingredients and choose to purchase the name brand product. Remember, it is hard to mix oil and water (which is what we are trying to do). 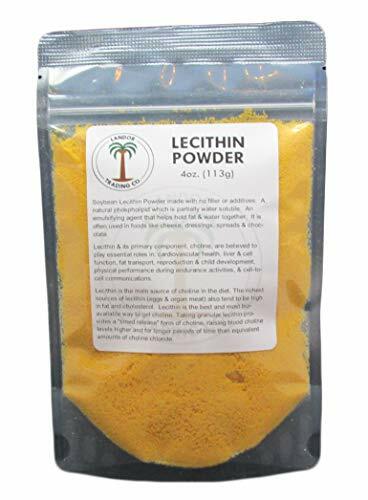 Adding some lecithin granules can help the mixture blend if you wish to make your own. Beekeepers have many different recipes in use. Always do careful research before adding anything to your honey bee colony. Do not take the advice of one source without doing your research. Essential oils are plant based natural products. However, they are very strong. Before using any essential oil, research the proper method of handing them. They are available in most health food stores and online. You should not buy the cheapest oil but you don’t need to pay the top price either. When purchasing essential oils to use in your honey bee colonies, choose a brand with a reputation for quality. Use care and wear eye and skin protection (if needed) when using essential oils in beekeeping. Using essential oils for honey bees is one part of a larger IPM (Integrated Pest Management) strategy. I do not think the use of oils alone will handle varroa mite issues-they should not be your only plan. 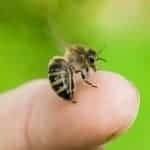 Beekeepers use essential oils to: help in the control of tracheal mites (a lesser mite problem) and varroa mites, help prevent nosema (an intestinal disease), aid in new queen introduction, use as a swarm lure and keep syrup from becoming moldy. There are many recipes available. The following three oils are the favorites in my bee house. Thyme Oil contains thymol. It assists in control of varroa mites a major killer of honey bee colonies worldwide. The thymol acts as a fumigant. The fumes confuse mites and block their breathing pores. Thymol is active against fungus and somewhat effective in control of tracheal mites. Spearmint Oil works in the same way as thyme. It masks the normal scent of the bees (making them harder for mites to locate). It does not mimic or interfere with normal colony pheromones. These important pheromones control activates inside the hive. We do not want to add anything that will greatly disrupt normal colony life. Lemongrass Oil – The most popular essential oil used for honey bees is Lemongrass. It is used as a treatment for pests, supplement for health boost or as a bait to lure honeybee swarms to traps. Lemongrass is antifungal and antibacterial. This essential oil does mimic some common honey bee pheromones. Be careful when using any lemongrass product with weak hives. The scent may attract robber honeybees who will destroy the small colony. The most common method of application is mixing the essential oil recipe into sugar syrup. This is then fed to the bees. Learn more about feeding bees: here. Be careful when using essential oils in bee sugar water. Follow recipes, measure carefully. Not every oil is suitable. Essential oils are powerful stuff ! I know I am saying this a lot but it is very important to remember. 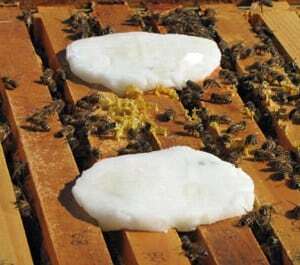 When used properly, pollen patties that already contain essential oils can be a good choice for the beekeeper. It is important to keep in mind that pollen patties must be used with EXTREME care in regions that have Small Hive Beetles. When to use them and how much to use will depend on your location. One great thing is that these patties can be frozen and used as needed. Many beekeepers spray the mixture (mixed with sugar water) directly on the honey bees. Do this with caution! -don’t chill the bees or spray directly into the cells. Using essential oils for honey bees can be a good part of a management program. However, use oils in moderation and with great care – they are powerful. As with any treatment plan, you can not just assume your treatment has worked. You must evaluate the hive to be sure it has been successful. Blend thoroughly in a blender (5 min). Pour into ½ gallon jug and add enough water to make 2 quarts. Do NOT heat the essential oils. This will make a concentrate. Use 1 cup of concentrate to 1 gallon of cool syrup. Grease patties have been in use for several years. They were originally used to combat tracheal mites. The addition of essential oils may provide some varroa control. 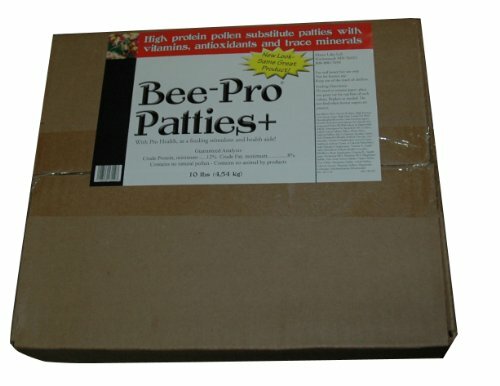 Grease patties can be used on hives most of the year. But they sure are a mess in hot weather! They should not be used when collecting honey for human consumption. In addition to being messy, patties may cause problems with another honey bee pest – Small Hive Beetles. Essentials oils added to a grease patty kill mites by direct contact. The mite is riding on the adult bee waiting for the opportunity to enter a brood cell. Mites exposed to the oils die within minutes. This method is only population control as not all mites will come into direct contact with the oils. Grease patties may also help control tracheal mites. Using essential oils for honey bees is just one example of the current efforts to raise healthy honey bees! The quest continues to find the best natural varroa mite treatment. I like to add small portions of pollen patties in late winter/early spring. You can keep them frozen for future use. A health boost essential oil mixture can be added to the pollen patty. When trying essential oils in beekeeping, use VERY small amounts – most folks add too much product. Proceed with caution. This post has been updated with current bee wonderfulness. I put lemongrass oil in one of my bee waterers. The bees stopped using it. Did I do something wrong? Perhaps you put too much Claire, bees have very sensitive noses. ( Hmm .. maybe I should say they have great olfactory senses). When you use oxalis acid do you close the hive up completely. I do for just a few minutes. Do u ever use Pro Health in your sugar cakes? I have not Rick but just because I’ve always had access to Honey B Healthy. Pro Health seems to be a similar product and I would expect it to work about the same. Any advise on how to use essential oils to keep a small new colony from absconding? “These important pheromones control activates inside the hive.” Do you mean”activities”? How often should I refresh the lemon grass oil in a swarm trap? I plan to put a few drops on a wick in a partially open zip lock bag. I’m not sure any essential oil would encourage bees to not leave a hive. Even though using too much of some mite make them leave! LOL Yes thanks. I think it would depend somewhat on the weather and temperature. Weekly perhaps. 4 of 5 are dead sense last summer.? even through there may be 3 honey suppers above 2 deep brood boxes.? I need help keeping Bee hives alive ! Keeping bees alive is certainly not as easy as it once was. Bees do swarm. It is natural even though is it not always best for beekeepers. Finding a way to control varroa that works and keeping good queens in you hives is a must. Love your blog! Question re: #2 herbal health boost with tea tree, lemongrass, speaking oils: is this a sugar water spray like recipe #1? I’m a new-bee, so my apologies if this is a silly question. Thank you Barbara. No serious questions is silly. You sure could spray a lite mist of this recipe on the bees during inspection. However, in general I think it best to feed it to them. recently I have been working with a hive that is very weak after coming out of winter. they had plenty of honey,,but a lot of the bees died. I have tried putting in a couple of frames of brood. I cannot see any eggs. don’t know if my queen is laying. Adding brood is good. If you add a frame of brood with fresh eggs, the bees will begin to build queen cells in 3 or 4 days. I’ve done lots of research to understand the different varroa mite treatments. At this time I’m looking at vaporizing OA as my primary method but I like the idea of using essential oils. Have you investigated using FGMO and essential oils in a fogger like a Burgess mdown? Most of the beekeepers that I know who used fogging (FGMO) did not have good results. It was found to be no more effective or even less than other methods. It is not approved and no reliable studies have been done to show effectiveness. So, I have never used FGMO. I would not recommend using essential oils in that method either. We have to remember that even though they may be natural – they are still very potent. You risk doing harm to the bees and/or yourself. In your two Bee Health Boost recipes, there is no thyme oil. Why? What’s the difference between Honey B Healthy and Bee Health Boost? Would you alternate Honey B Healthy and Bee Health Boost? There are many different recipes in use by beekeepers. I would use either Honey B Healthy or Bee Health Boost. Either should work as well. I think you might try lemon grass oil but it would only be a drop or so. Bees are very sensitive to scent. What is the grease patty recipe? Can I rub some essential oil (menthol, eucaluptus or thyme on the front entrance of my hive to discourage mites? I dont think it would work. When essentials give some benefit in the hive, I have found that it is either through direct contact with the mites and/or just promoting overall better health in the bees. Keep in mind that undiluted oils are very powerful, it might cause a bigger problem. Embarrassed to admit that I dont really use a recipe most times. I measure out how much dry sugar I think I will need to make the patties and then add enough crisco to make it stick together. If you are adding Wintergreen Essential Oil to the mix – you must wear gloves as it can absorb through the skin and become a danger to you!. I would apply 3 – 4 drops and repeat every week or two. Bees have a keen sense of smell . We dont want to overwhelm them. Why not use hops essential oil as a treatment for mites on honey bees sense hopsguard is being used as an effective treatment? Essential oils are natural but concentrated and powerful. I would not advise hops at this time because I have not read of anyone using them. I am always concerned about safety. And any EO is not a silver bullet for mites – my hope is that they promote good health and this is good for the colony over all. I grow a lot of thyme. What are your thoughts of cutting handfuls of thyme and laying them across the frames for the winter? Hi Charlotte, I am wondering about putting in twigs of spearmint and Lemon thyme directly into the hive, say on top of the frames. Would there be any positive benefit to that? I’m not sure Tammy. It might cause more harm than good. I would be hesitate to do it unless some reputable beekeepers can explain more. I dont think so at this time. It is the extract – oil of the plants that seem to have some benefit. Actual plant parts would give moths and hive beetle more room to hide. I would resist doing it at this time. Hi I am looking at the recommended practice of adding a layer of wax to new frames. I was thinking that adding some essential oil to the melted wax would be a way of getting the essential oils into the hive. Can’t find any information on this strategy. I would not. There is a difference between putting some natural beeswax (that bees make) on frames vs adding something else. Sometimes we can “help” our bees too much and it causes problems. Would there be any harm in planting thyme and spearmint near the hives? Or would that be a weak effort and ineffective? It would look pretty and the bees might enough the blooms. But, I dont think it would have much if any impact on mites.